THE AVERAGE Galapagos Tortoise can expect a lengthy and leisurely life. Weighing over 500 pounds, these tortoises nap 16 hours a day and spend the rest of their time eating. Occasionally moving as fast as 0.2 mph, they live out their slow paced lives on the idyllic Galapagos Islands, enjoying a lifespan of over 100 years. 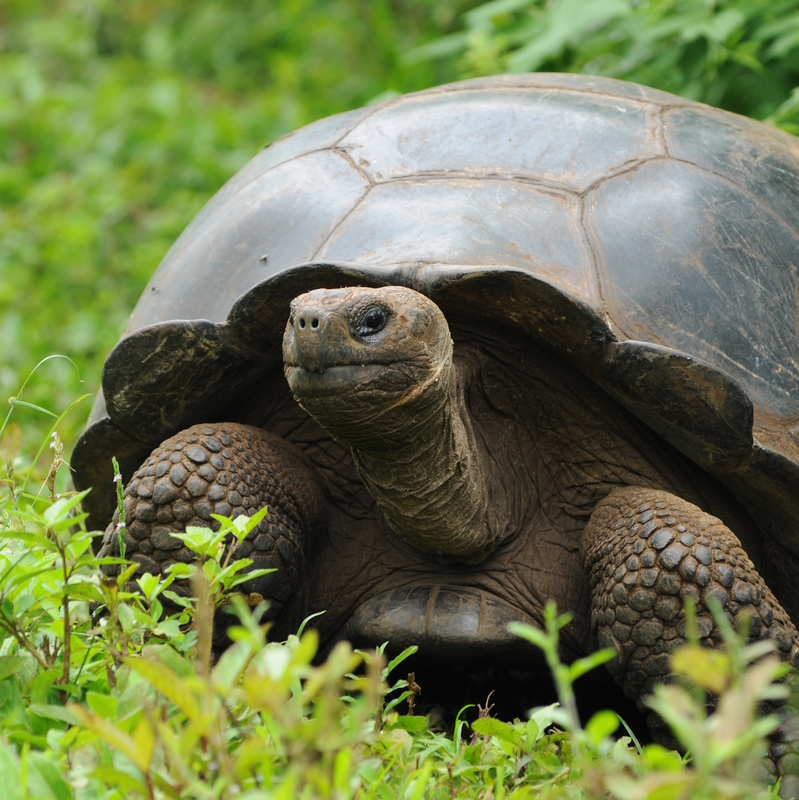 Until recently, the slow-paced tropical lifestyle of the Galapagos tortoise was under threat. The culprit? Introduced by whalers and pirates in the 1800s, goats are considered to be an invasive species on the Galapagos. Without any native predators, wild goat populations spread throughout the island chain, surging to 100,000 individuals in 1997. Hordes of invasive goats on Isabela Island. Photo credit: Galapagos National Park Service. The hungry herbivores devoured all vegetation in site, including the delicate mist forest habitat of the Galapagos tortoise. During the dry season, tortoises use the forest as a source of fresh water, congregating around puddles left by dewdrops from the forest leaves. 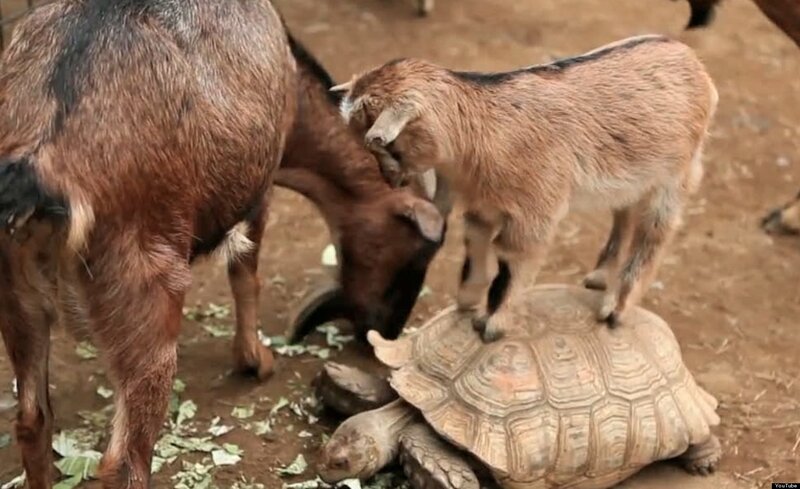 As the goats stripped more and more of the land bare, the tortoises began to disappear. 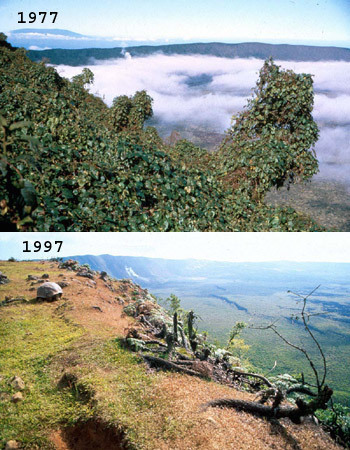 The view of Alcedo volcano on Isabela Island, before and after the invasion of goats. Photo credit: Tui de Roy. To save the delicate ecosystem and the tortoises along with it, scientists and land managers on the Galapagos orchestrated a goat eradication plan. Called Project Isabela, the plan was launched in 2000 and relied on tactical training, emerging technology, and major firepower. At first, execution of the mission was quite simple, if not expensive. Trained sharpshooters were sent in helicopters to scour the island for goats. Once found, goats would be shot from the air, either in the head or the heart to ensure a quick death, using high power weaponry and military precision. Many people, including the plan’s orchestrators, had misgivings about such a large-scale slaughter of goats. However, the decision was made that the Galapagos ecosystem, under threat and found nowhere else on Earth, was valuable enough to justify their actions. Eradication went quickly at first, and 90% of the island’s goats were eliminated within a few years. However, the remaining goats learned to be wary of the hunters. To achieve their goal of total eradication, the team had to be more cunning. While the mass slaughter of goats may sound cruel, Project Isabela has removed the primary threat facing 65% of endemic species on the Galapagos Islands, including the Galapagos tortoise. Photo credit: Josh Donlan. A handful of wild goats were captured, sterilized, injected with hormones, and fitted with radio tracking collars. Then the researchers released them. A few weeks later, researchers took to the skies again, this time with the precise locations of the tracked goats at hand. Thanks to the hormone injections and social herding behavior of goats, the tracked goats often had made unsuspecting companions in the interim. Sharpshooters would pick all of them off, except for the tracked goat, which would be released again to attract more friends. The tracked goats were aptly named “Judas goats”. The program was so successful that all Galapagos goats, except for the sterilized Judas goats, were eliminated from the islands by 2006. The handful of remaining Judas goats have been allowed to live out their days on the islands as a perverse reward for betraying their species. The speed at which the native Galapagos vegetation has rebounded pleasantly surprised scientists, and the entire ecosystem is on the mend. Galapagos tortoise populations have rebounded from 3,000 to 19,000 individuals, although the species is still classified as vulnerable. Project Isabela was the largest invasive goat eradication project in the world. However, the issue of invasive species is neither confined to goats nor the Galapagos. 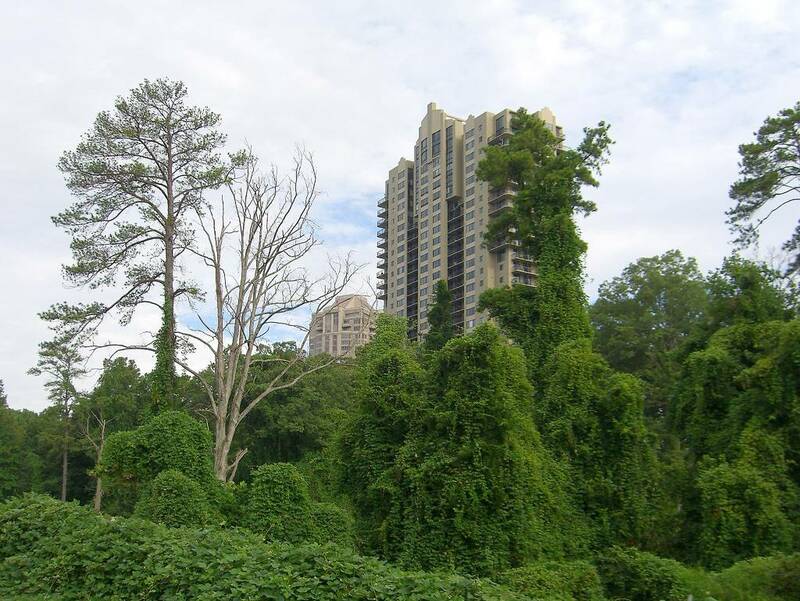 Invasive plants such as kudzu quickly overrun native plants. Photo credit: Flickr user beardnb. Invasive species are organisms that are not native to an ecosystem, and many have been either purposefully or inadvertently introduced by humans. The most damaging invasive species are prolific breeders and habitat generalists that can use resources faster than native species. The sudden appearance of introduced species can threaten the very existence of native specialist species, which have evolved over millions of years in the absence of introduced competitors. Invasive species have become a massive problem worldwide with the rise of globalization, and are second only to habitat loss as the leading threat to biodiversity. Island ecosystems are especially susceptible to foreign invaders. Despite covering only 5% of the Earth’s surface, islands are home to 20% of all bird, reptile and plant species. If that figure surprises you, consider this: most islands exist in near isolation, with discrete animal and plant populations that evolve under unique circumstances. Over time, millions of endemic species have evolved that exist only on their respective island. And our planet has a lot of islands. 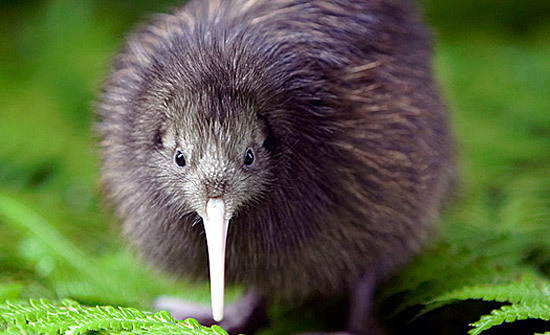 The kiwi is an iconic flightless bird native to New Zealand. Photo credit: Chris McLennan. The isolation of island ecosystems has positive and negative aspects. Remote islands often have fewer predators, allowing unique animals such as flightless birds and slow moving tortoises to thrive. But as species let their evolutionary guard down, the introduction of skilled predators or strong competitors can be devastating. Species found only on islands account for 80% of all extinctions that have occurred in the past 400 years. 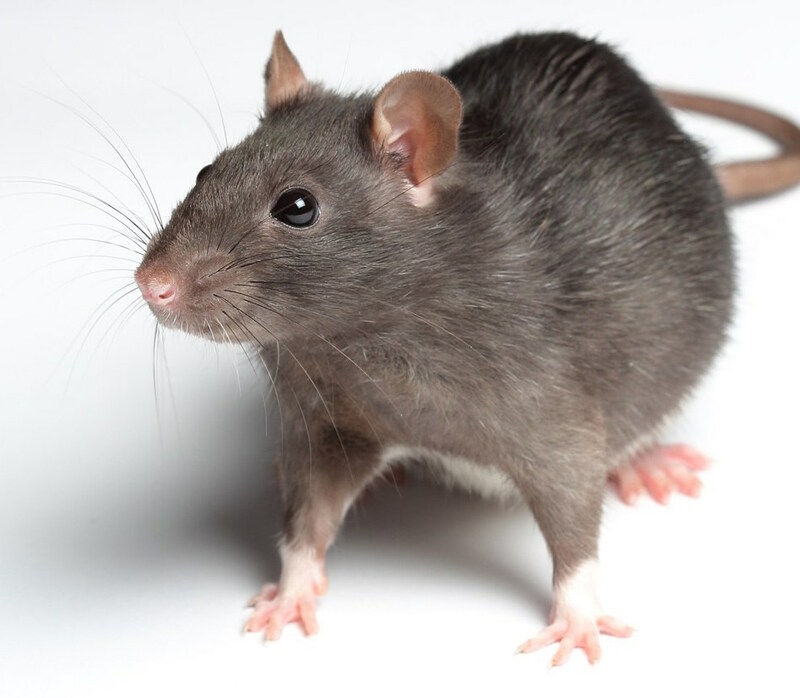 Rats are commonly exterminated using huge quantities of toxic rat poison, often necessitating the removal of the threatened local fauna until the project has been completed. Photo credit: Shutterstock. Thankfully, the small size of most islands makes invasive species eradication a manageable task. In total, 934 islands worldwide have benefitted from 1437 successful invasive species eradication projects, encompassing 59 different invasive species from feral goats and pigs to cats, foxes, and even invasive plants. Above all, rats are the most prevalent and damaging invasive species on islands, and large colonies of them commonly wreak havoc on nesting seabird populations. Eradication of invasive species on nearly a thousand islands is no small feat. The collective efforts of land managers, hunters, trappers, and conservationists have saved hundreds of endemic island species from extinction. While the threat of invasive species is highest on remote islands, nearly every ecosystem is affected by invasive species, including your local community. While invasive animals capture most people’s attention, many invasive species are actually plants. Click here to learn about the most pressing invasive species issues facing your region. In addition to learning about local invasive species issues, here are five steps you can take to curb the spread of invasive species near you. If you see a plant that is invasive to your region (and you are sure that it is not poisonous), treat it as a weed and remove it. If you garden, plant native species and forgo exotic plants. Never release exotic pets! Many invasive species introductions, such as the python in Florida or the snakehead fish in the Eastern US, have been caused by well meaning pet owners who can no longer care for their exotic pets. Make sure to clean your outdoor recreation gear (including hiking boots) to avoid giving invasive species an accidental lift. When you travel, don’t try to sneak exotic souvenirs back in your luggage. Obey customs laws; many are designed to keep invasive species out. Volunteer with your local conservation organization! Lots of on the ground, community based conservation revolves around invasive species removal. By getting involved, you can ensure the longevity of your local ecosystem. You deal with such important issues! Thanks! Please feel free to shoot me an email if you think of any conservation success stories or environmental causes that you think I should cover in the future! Take Home Message: Invasive species wreak havoc on islands, and the goats of the Galapagos were no exception. A controlled hunt was able to successfully eliminate goats from the Galapagos by 2006, protecting the Galapagos tortoise and other native species. While islands are the most susceptible ecosystems to invasive species, their small size makes eradication efforts feasible. You can help to stop the global spread of invasive specie: plant native species in your garden, avoid exotic pets and plants, and volunteer with conservation organizations.